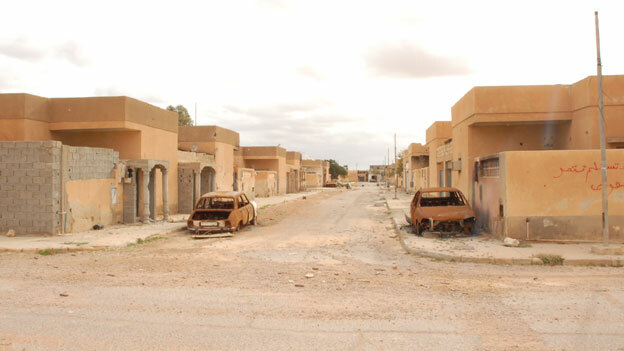 Tawergha, a ghost town. A place of ash. I didn't expect to start crying, but I did. Reading this book, starting off with Psalm 90, perfect for this day because of the line about people turning into dust. But instead, a later verse catches my eye, and then my heart, and then my tears: "Make us glad for as many days as you have afflicted us, for as many years as we have seen trouble." This morning we gave our children cheap chocolates and books they will love. At the elementary school I saw streams of children clutching flowers and cards and teddy bears to give to their teachers. I spent the morning trying to take care of myself (exercise, prayer) and working on articles. My husband went to work and my toddler did finger painting, then ate lunch, then we read three books together and I rocked him in a dark room while he sang songs to me. I knew I wouldn't be going to an Ash wednesday service, this year would be like any other. My toddler will sleep during the midday services and then there is school pick-up, then going to a neighbor's house to learn all about pokemon cards, then dinner and clean up and baths and books and collapsing into bed early, so impossibly early. But I sat down to read a book, and I couldn't stop crying. Today is a day all about love, today is a day all about death. And they are so finely connected, the latter illuminating the former, that I can barely catch my breath. Every so often I let myself feel what it means to be close to death, every so often I let myself feel what it might mean to be loved, and to believe that this life of suffering is not all there is. Last year for Lent, I focused on one issue to delve into. Looking back, I am amazed at all I was able to do, the books read and the posts published. This year I don't have it within me to blog, to post, to try and convince others to join me as we wage a war against injustice. As is my way currently, I am just wandering my way into situations without any real plan. I am just trying to show up, and to pay attention. A neighbor of mine stopped eating, stopped wanting to come to events. She told me she was so sad, because of what was going on in her home country. She had told me about her city before, had told me when she was 7 months pregnant with her second child she had been forced, along with everyone else, to flee her city and find refuge on foot. That city, the one that was hers, is now a ghost town, a testament to displacement, in the middle of a desert. My friend's second child is now a bright and active kindergartener. It has been almost seven years since my friend, her family, and her inlaws were forced to leave. People are now trying to move back, with the blessing of the government, but men with guns are stopping them. My friend cannot eat, can barely talk, because everyone she loves is half the world away, waiting to go back home, facing machine guns and tents in the middle of the windy desert, suffering while hoping things will get better. My friend asked me to help her protest. To come up with a hashtag. To make people care. I looked at her, this beautiful woman. Who would listen to us? Two people, advocating for a town half the world away? I knew it wouldn't make much of a difference, but I told her I would do whatever I could to help her. I've been reading articles, researching the history, slowly peeling away my own ignorance, slowly discovering another sign of affliction. And without even knowing what I was doing, I knew that this is what I would be doing for my Lent this year. Pouring time, attention, and prayers into this one injustice, this one broken heart, this one issue. For as many days as my friend has been afflicted, as her family has been cast aside--supposedly for supporting the then-president, but really for the blackness of their skin--for as many days as she has seen trouble, I want to believe there will be days of gladness for her. I think back to the times in my life I have been the closest to dust. In hospitals, with quiet nurses and hushed voices. A few times people letting it slip how close to the edge I was, followed by bright and cheerful reassurances that everything was fine now. I didn't get to grieve, didn't get to sit with my own mortality, because I had other lives depending on me. For my own suffering, for my own affliction, I received two children. The few nights my heart and my body spent struggling to hold on have been eclipsed by the years of joy of hiding under blankets and reading favorite books and having little hands reaching up to hold mine as we walk around our neighborhood. But still, I wonder. Who are the people in our lives so close to dust? Who are the ones whose lives are disproportionately filled with affliction and trouble? Who are the ones who most need to hear of a God who will satisfy us in the morning with unfailing love? Perhaps it is your neighbor, perhaps it is you. In this season of fasting, of giving so much up, I want to sit and stay in the place of ashes for awhile. And maybe, I am writing this out and posting it here, just in case anyone feels the same. If there is an issue or an injustice or story of trouble and affliction God has placed in your life I would encourage to stay with it for this season. To show up, and to pay attention. I won't be posting about it on my blog, but you might find me occasionally tweeting about the town of Tawergha, in the country of Libya. One story amidst the thousands of suffering. But one story that deserves to be known, and understood, and lamented. And one day, we hope, a story of rebirth to be celebrated. I still don't quite know why I am crying so much today. I'm not at a holy service, my forehead smeared with ashes. I'm not someone who is very prepared for this season, I am not even really giving anything up. But I am someone who knows what it is like to long for good news, to feel like the days are one long stretch of sadness. I am someone who has been close to death, surrounded by people who have barely escaped the ash themselves. And together, we take it one day at a time. Trusting that soon, we will be made glad together. the movie that shaped my imagination at age 8. I can recall the first moment I felt the pangs of disbelief, marked with an electric current of fear: I saw a man gliding down an escalator inside his own mall to announce his presidential election bid. The gaudiness, the banality of the setting, his face, his words and cadence. The anti-christ, so much more garish and unsubtle than I had been taught to believe. I watched with growing trepidation, months after months of almost unbelievable vitriol, rhetoric, lumping entire people groups into fearful or hateful categories, friends brushing away my concerns that this could actually happen. On election night, one year ago, I sat in my living room in the middle of prayer meeting and I checked my phone. He’s winning, I announced to the faithful gathered at my house. He is going to be our next president. We were all shocked into silence, and then a few people tried to say encouraging words about the future, tried to pray as if God were in control of our politics. But I couldn’t hear them anymore. I had already gone to a place deep inside of me. I was already busy preparing again for the end of the world. As a child, I was taught about the end of the world. Eschatology was a huge part of my life and upbringing. And then, on November 8th 2016 I was plunged into a world I had been taught to look out for: feeling powerless in the face of God-orchestrated political events, people rising to power on the backs of the oppressed, high levels of hysteria, rumblings among other countries, unrest, protests, false calls for unity, the need to prepare for things to get much, much worse in the foreseeable future. I had dreams at night about being on a cruise ship that had been turned into a lifeboat for those seeking to flee to safety. I had dreams at night about surviving, while everyone around me perished. If I watched the news, or looked at Twitter for too long, I was plunged back into my eight-year-old mind: will I survive the apocalypse? “The Conversation” as Rebecca Solnit calls it--the constant waves of fear and despair and anger I was seeing in my mostly-progressive circles--brought all my apocalyptic fears back in a flash. Although now it was also compounded by disillusionment, since the very people who had prepared me for the last days ended up being the ones who ushered it in. The twist that I never saw coming was that the apocalyptic threads of theology I picked up as a child can be traced parallel to evangelical Christianity’s obsession with obtaining cultural power. In years where democrats were elected (or civil rights demonstrations skyrocketed), Christian apocalyptic thinking became more popular, books were sold, theologies of a world getting worse and worse until it suddenly ended grew. But when things were looking up—Republican presidents, for instance--the end times language quieted down. I had grown and drifted away from many of the political beliefs of my religious community while still retaining much of the doctrine and values. So I wasn’t paying attention to the prophecies and dire predictions sprinkled throughout conservative, charismatic websites during the Obama years. I didn’t quite understand when the first Christians to openly support Donald Trump with enthusiasm were the same people who had said only a few years before it was all going to end. Why did Charisma magazine publish a piece declaring Trump to be a “Trumpet of the Lord” way back in June of 2016? Why did big-name evangelicals like Franklin Graham and Jerry Falwell Jr. endorse a candidate with a history of misogyny, racism, greed, and corruption with enthusiasm, pointing to the election night victory as a sign of the miraculous intervention of the hand of God? Did they really think they had safely averted the apocalypse? Or were they really just celebrating a return to power? When the president declared in June his intention to pull out of the Paris agreement, several prominent conservative Christians publicly agreed with him. They said: climate change is a myth, it is not a matter of salvation, God made humans to be stewards of the earth so we could never mess it up so royally, Jesus will be returning in the end times to destroy the earth as we know it so why not hurry along the process? It was a gleeful march towards the apocalypse, because the ones who ushered it in thought that they, of course, would be the ones to survive it. I read the news with dismay and something akin to deja vu. Climate change, a spike in ICE raids in my neighborhood, travel bans on countries I loved. My apocalypse had arrived, just as I secretly always knew it would. I just didn’t think people claiming my religion would be the ones in power, that we would be the ones to usher it in. No brimstone, just the promise of restoration. This was a different book, and a different view of the world, than I had absorbed as a young child. There was no fear to be found, just a longing for a better world rooted in justice and equality, a world where no one ever had to live through the destruction of everything they knew and loved. The seeds of hope started to be planted in me. Could this be true? Could God's dream for the world be one of new life, instead of fire? My brother-in-law is South Sudanese. He listens to the white American Christians he knows talk about prophecies of the end times coming soon, and he chuckles. War, death, famine, poverty, sickness, oppression--these things have been experienced by my brother-in-law and countless others around the globe, both currently and in recent history. The true end of the world, however, will only happen when white Americans experiences these terrors. Then, and only then, he told me, will the apocalypse count. Many of my current neighbors are refugees and immigrants. They too have survived, and are busy rebuilding worlds in the shell of the old. I watch them cook food and parent their children, and they catch my despondent eyes and tell me not to worry. I am trying to believe them, but old beliefs die slowly. My whole life I have been looking for a prophecy telling me exactly what is to come, who to fear, and what destruction to expect. Instead, all I have been given is this day in front of me. At the grocery store I still think idly of stocking up on bottled water, of buying large canisters of dried potato soup. I think about when I was a child and my mother taught me what it meant that life would not always go on forever, that we might need to one day work hard to ensure survival. I think about how I was raised to resist a government that oppresses people, and how persistence was taught to me from a very young age. To face the fear, to pay attention to the signs, to be prepared, to watch out for the vulnerable among us. As it turns out, my apocalyptic background has been both a boon and a burden in these current political times. I am both acutely aware that we are in a new time, and that the world I thought I lived in is gone and never to return. The end of one world must be given careful attention, because that is what apocalypse means: a revelation, an unfolding, a new way to move forward out of the ashes of the old. I am busy preparing, once again, for the end of the world. I wish we had all been ready, indeed. I wish we had been listening to the real prophets in our midst, telling us America never has been as great as we all so wish it was. But I am finding it is never too late to cultivate hope in the midst of despair. It is never too late to learn from those who have survived the apocalypses they were born into. And now is the time to work towards the rebuilding of a world that is better than the one we left behind.